As the referendum campaign nears its end, one central issue is remarkable for its absence, despite the fact that it has been a major contributor to the anger that lends support to the Brexit camp: neo-liberalism. The revolt against the political parties, the rejection of the experts, the distrust of the elites more generally—all of this has to do with neo-liberalism—as does the venting by working and middle class people against the worsening of their life chances due to stagnant wages, growing inequality, and the increasing difficulty for the young to get a foot on the real estate ladder, or a steady well-paying job. And yet the real cause of these concerns is never addressed. Instead, the EU and immigration are blamed for all of Britain’s ills. But whether the decision on June 23 is Leave or Remain, neither Britain’s problems nor citizens’ dissatisfaction will go away. Neo-liberalism has been so resilient in the UK as well as in the EU that it receives barely a mention in the mainstream press or in public debates. It is so pervasive that it is hardly recognized as a major source of the disenchantment that lends support to the Leave campaign. Better to blame the outsiders (i.e., immigrants and Eurocrats) than to recognize that the problem comes from the inside, from the policies of British governments. Democratically elected British governments beginning in the 1980s sought to transform the UK economy based on a neo-liberal economic philosophy. 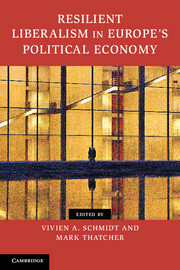 It touted the market as the solution, the state as the problem; denigrated politicians and civil servants as rent-seekers not to be trusted; believed that financial market players were rational actors who deserved little or at most ‘light touch’ regulation; and promoted a growth model focused on debt-based real estate speculation rather than rising wages, and on service industries in place of manufacturing. It should be no wonder, following the financial crisis of 2008 with the concomitant rise in job insecurity and poverty, in the face of no change in the neo-liberal discourse let alone the policies, that working people would have lost faith in their politicians, and expect some alternative. But, surprisingly, there is no mainstream alternative, just the sirens of the populists blaming immigration and the EU. Next Next post: Brexit and the EU: A new deal for all the EU or no deal at all?